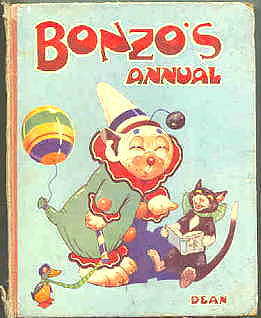 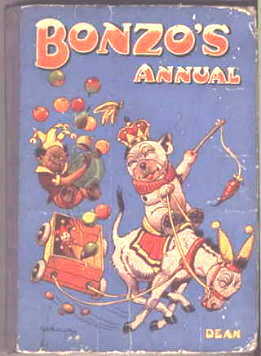 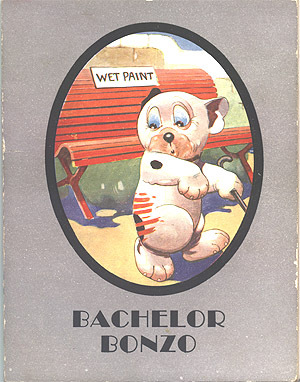 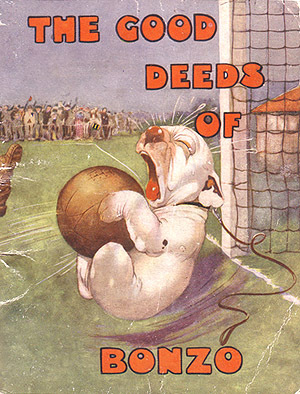 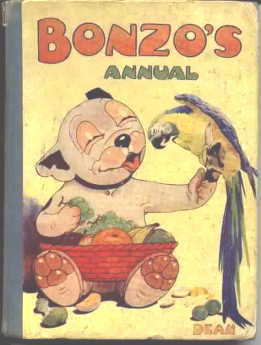 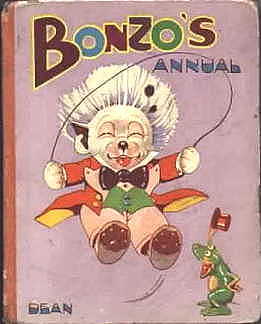 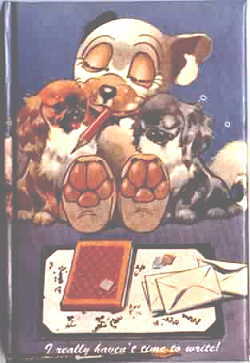 Bonzo annuals were issued by Dean & Son Ltd. between 1935 & 1938, then after the second World War between 1947 & 1952. 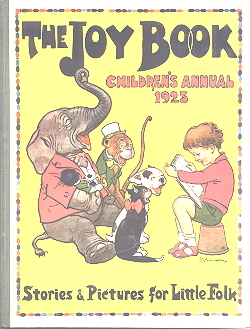 All of the annuals produced up to, and including, 1948 had illustrations by George Studdy. 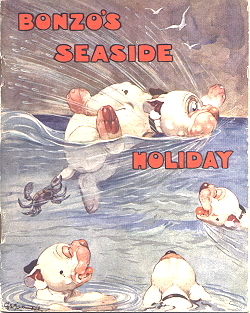 From 1949 onwards his only contributions were the cover illustrations. 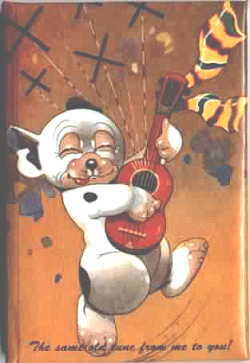 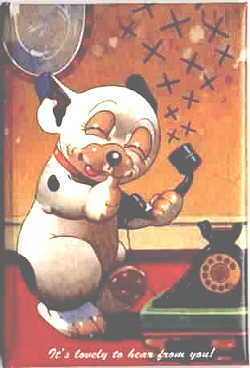 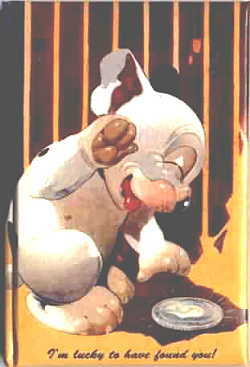 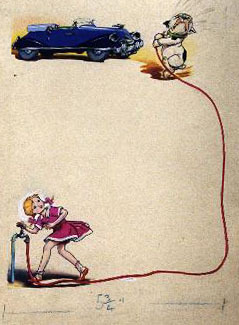 An artist by the name of McCready produced much of the artwork for later issues and examples of that original artwork are shown below. 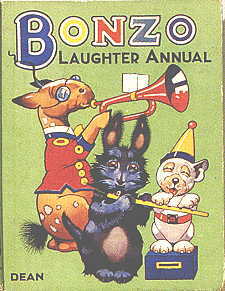 These were used in the production of the 1950 annual. 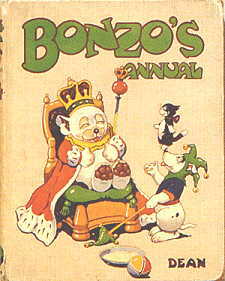 The images can be seen in the annual on pages 61 and 21 respectively. 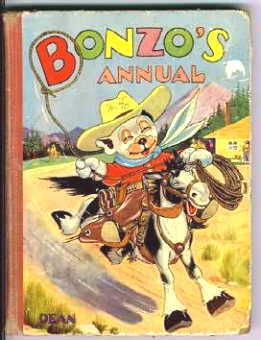 Dean and others produced many more books and annuals such as those shown below. 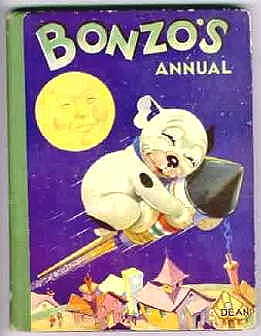 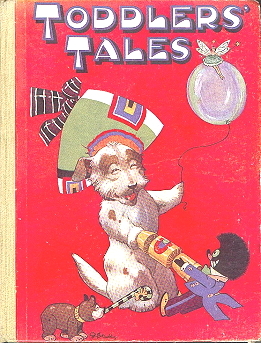 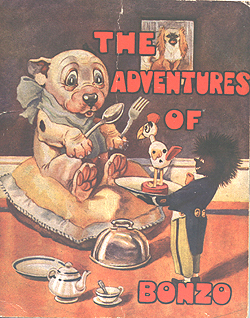 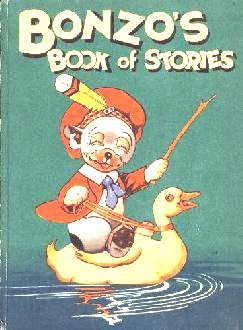 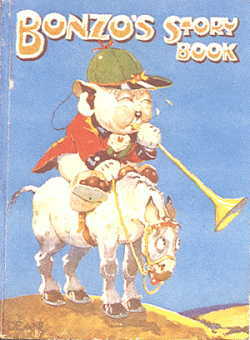 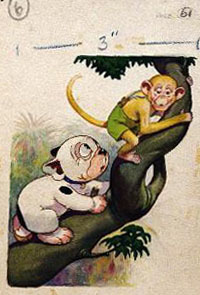 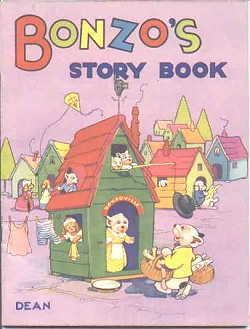 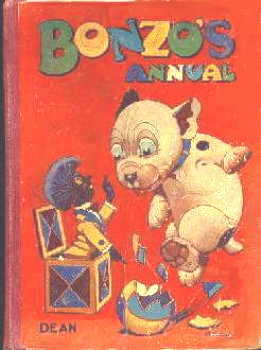 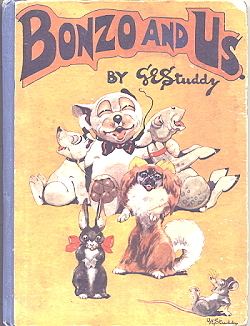 The first of these books, Bonzo's Book of Stories and Bonzo's Story Book (blue cover), were both hardback books similar to the annuals while the later two were both softbacked. 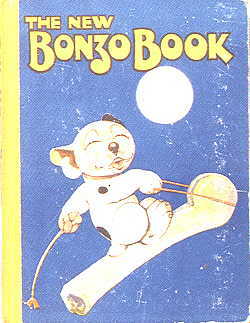 These softbacks contained fewer pages than the 'annuals', sold for less, but the stories were typical Bonzo! 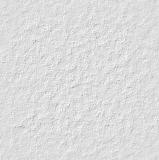 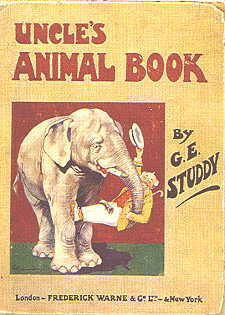 In addition to the two softback books above four further books, published by B.B. 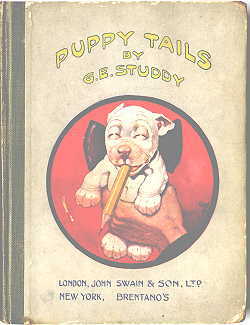 Ltd, England, were also issued. 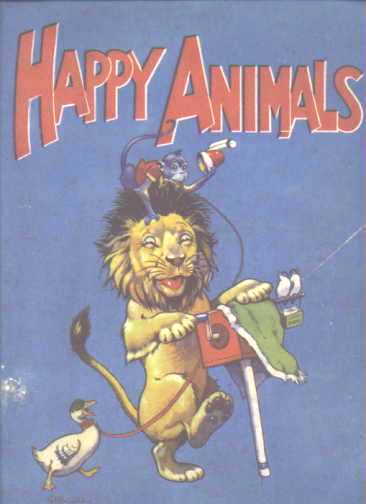 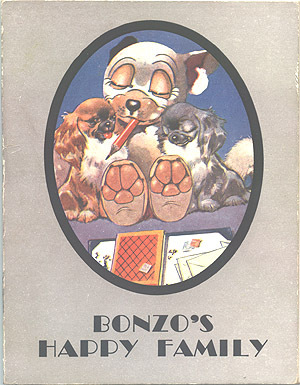 Two of these, Happy Animals and Animal Fun, showed a wide range of creatures - none of them Bonzo. 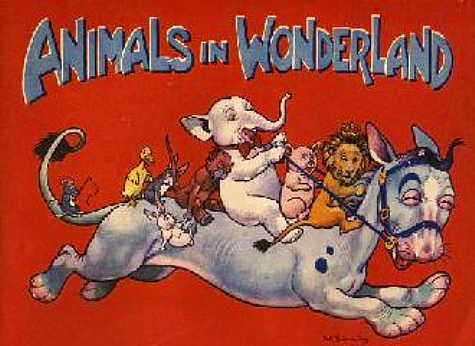 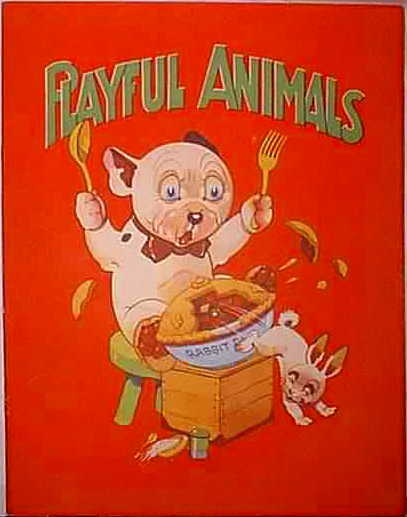 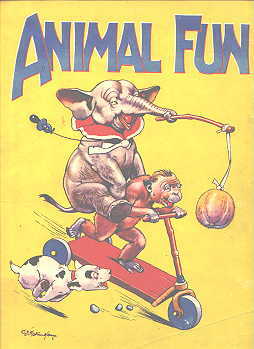 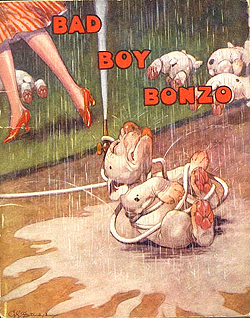 Playful Animals and Animals in Wonderland showed Bonzo in many of the scenes. 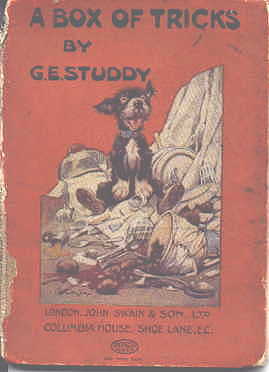 Many Studdy illustrations appeared in annuals, books and magazines throughout the 1920's and 1930's, even through the 1910's his caricature studies could be seen in the Sketch, Bystander, Tatler, Windsor Magazine and many more publications from home and abroad. 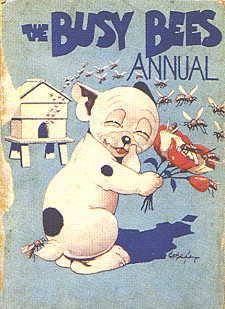 In the prints pages some of these individual items can be seen, though I include in this section The Busy Bees Annual, A Chinaman in Sussex and Toddlers Tales shown above for which Studdy only drew the covers and the Joy Book Annual for 1923 for which Studdy provided the cover as well as plates and in-text illustrations for some of the stories. 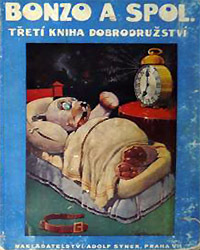 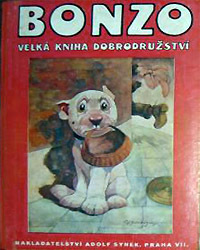 The three books, above, were issued in Czech and are very difficult to find, they roughly correspond to The Bonzo Book, The New Bonzo Book and Bonzo & Us. 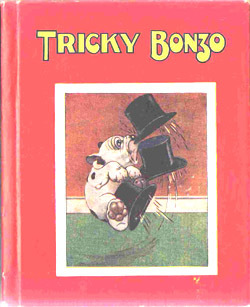 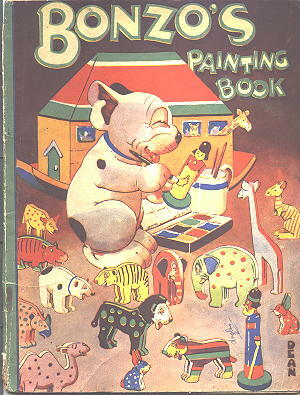 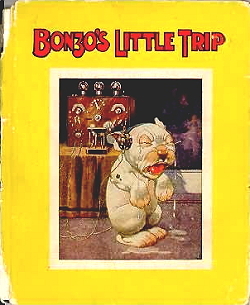 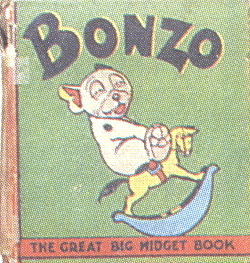 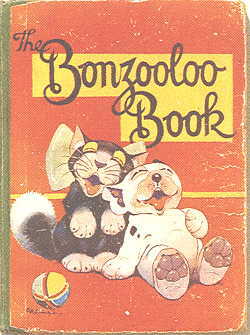 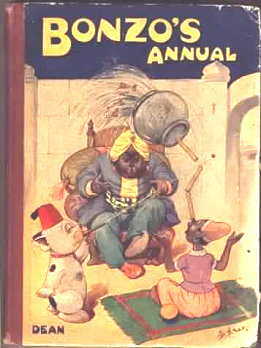 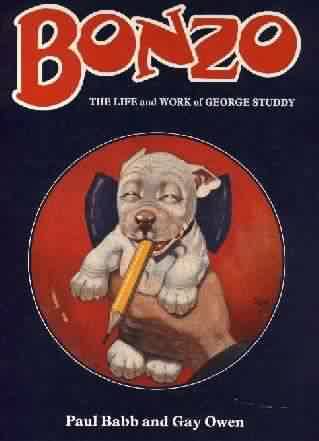 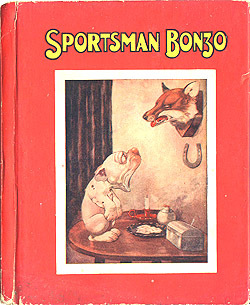 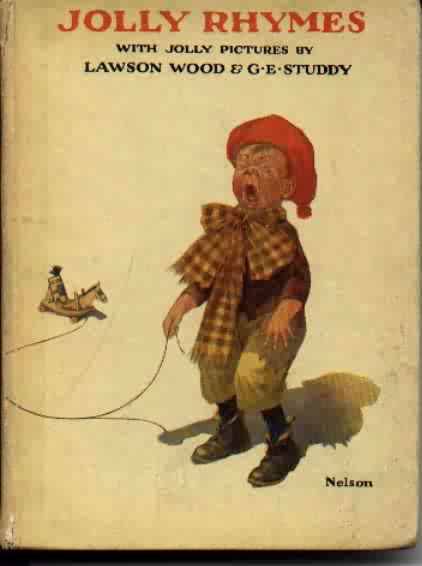 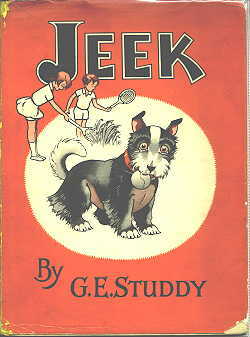 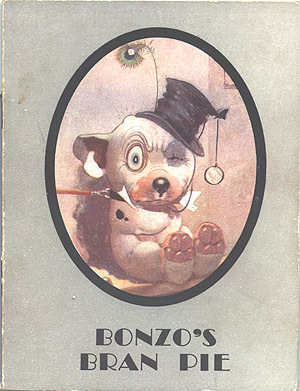 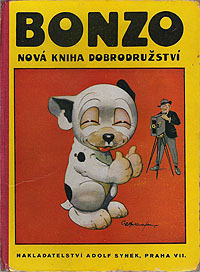 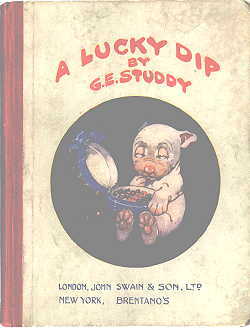 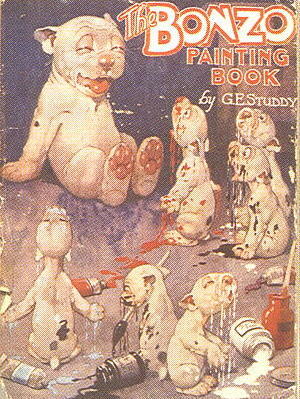 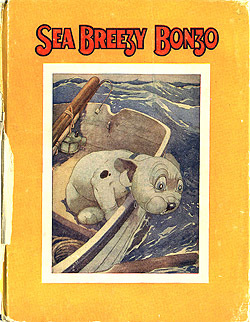 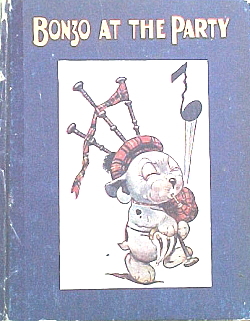 There were several series, of small format books, both hard and soft covers, having short stories of Bonzo illustrated with prints and line drawings by Studdy. 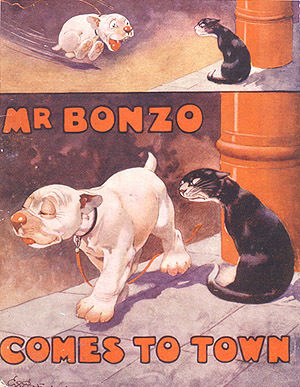 Probably the best known of these were by John Swain & Son (Brentanos in the US). 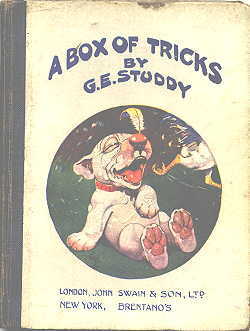 This set of three books were 'A Lucky Dip', 'A Box of Tricks' and 'Puppy Tails'. 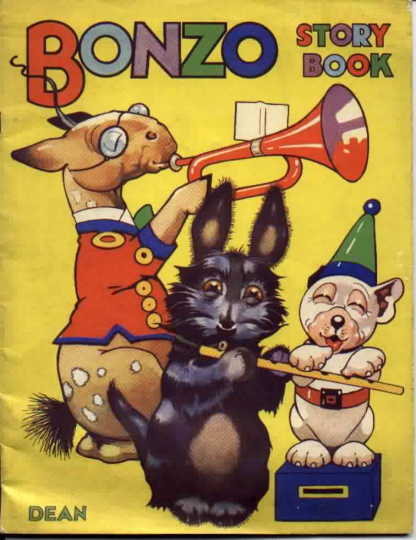 These three books were also issued in other languages (see later pages).
. . . . . the books were also available in German, published by Artur Wolf and in French, published by Hachette and can be seen on pages 2 & 3 respectively of this section. 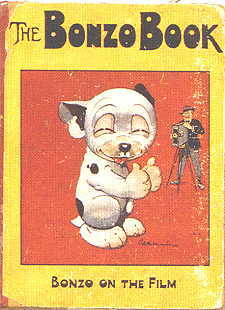 In addition to these, other small format books were also issued by McLoughlin Brothers, Thomas Allan (Toronto) and by the Dunlop Press in sets of six. 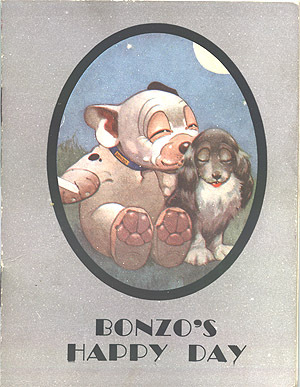 The McLoughlin Brothers books included 'Tricky Bonzo' , 'Bonzo at the Party', 'Bonzo Visits some Friends', 'Bonzo's Little Trip', 'Sportsman Bonzo', and 'Sea Breezy Bonzo'. 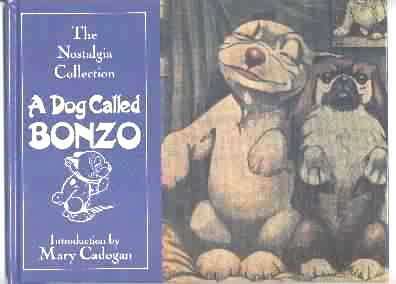 These were all hard cover books with stories and prints many of which also appeared as postcards or folio prints. 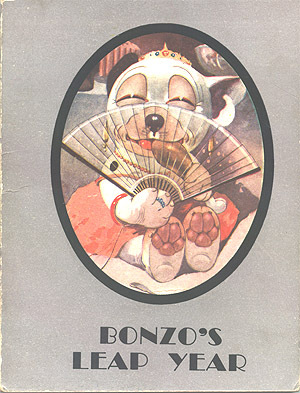 The Dunlop Press books had paper covers but were of a similar format inside. 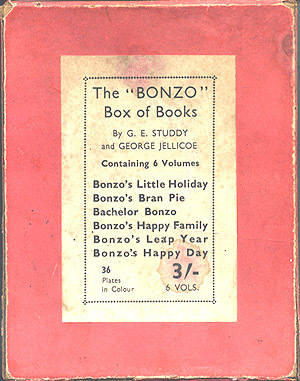 This set consisted of 'Bonzo's Little Holiday', Bonzo's Happy Day', 'Bonzo's Leap Year', 'Bonzo's Happy Family', 'Bachelor Bonzo' and 'Bonzo's Bran Pie' and came in a box called The "Bonzo" Box of Books, originally costing 3/- (that's 15p to you decimalised folks). . . . 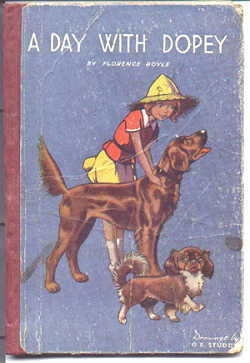 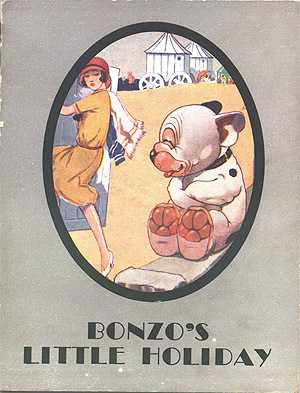 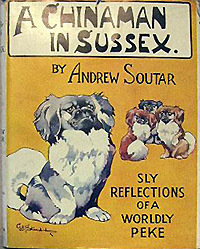 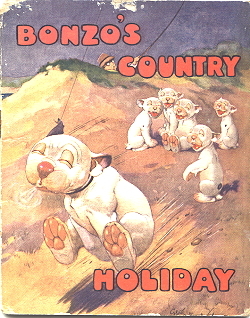 The books published by Thomas Allen also had paper covers, were smaller than those detailed above and these books were 'Bonzo's Country Holiday', 'Bonzo's Seaside Holiday', 'The Good Deeds of Bonzo', 'Mr. 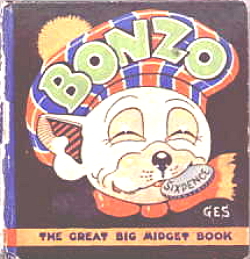 Bonzo Comes to Town', 'Bad Boy Bonzo' and 'The Adventures of Bonzo' - these were also issued in Dutch & German.
. . . and finally, the two smallest Bonzo books printed (to my knowledge), 'Bonzo, The Great Big Midget Book'. 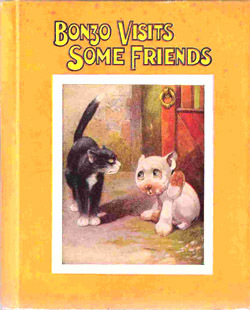 Both books had the same title, different covers. . .
. . . last but not least, some other, older, publications . . .
. . . . . and some modern releases . . . . .